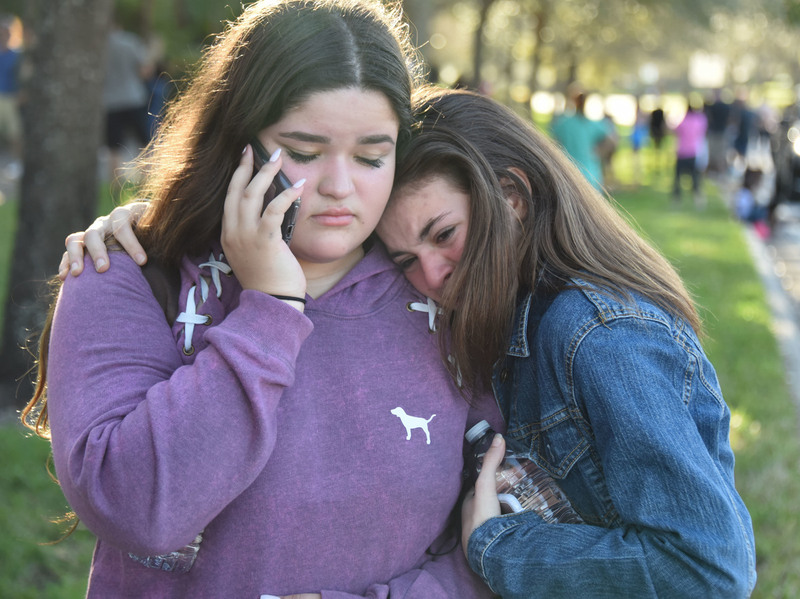 Should The Parkland Shooting Change How We Think About Phones, Schools and Safety? : NPR Ed Security experts say allowing students to have their phones with them during the school day is unlikely to make anyone safer. Maybe even the opposite. Students use their phones following the shooting at Marjory Stoneman Douglas High School in Parkland, Fla. According to Education Week, "One girl was so emotional and overwhelmed that she handed her phone to her teacher, who reassured her mother: 'They're well taken care of. We're secure. No one is going to come in here. I will make sure that these children will be fine.' "
Ken Trump has been a school security consultant for 30 years. When he started, pagers were pretty much the only devices carried by students, and those were often associated with drug dealing or gang activity. With the advent of cellphones and then smartphones, "I was originally: No. Period," from a security standpoint, he says. But now, "the reality is, the horse is out of the barn." Daniel Domenech, executive director of the American Association of School Administrators, told NPR that in general, the organization advises school districts to let students have phones on them during the school day. "You can see the advantage of being able to communicate easily" in light of the Parkland shooting, he said. Randi Weingarten, president of the American Federation of Teachers, the nation's second largest teachers' union, tells NPR in an email: "Every day, but especially in a crisis, cellphones give parents peace of mind. The reality is that kids need access to cellphones to get to and from school safely and to let parents know they're OK." While districts should be free to make their own rules, Weingarten says, "we must recognize cellphones as an essential safety and security tool." "Without a doubt, the cellphones provide an emotional security blanket for parents and kids," Trump says. As a father himself, "I get that, my heart is there." Nevertheless, says Trump, the weight of the evidence is against having free access to phones in a crisis. "I'm in a rare position professionally where I understand the downsides of it." But schools, and school leadership, aren't necessarily seeing those downsides. Maybe that is because there is no one federal agency responsible for disseminating information or training on security and crisis procedures for schools, including on the use of phones. The Departments of Education, Health and Human Services, Homeland Security and Justice all offer resources but take a "piecemeal" approach, according to a 2016 report by the Government Accountability Office. For example, there is a company called Yondr that markets a patented locking pouch for phones. It's in use by schools, concerts and events. The company's own research concurs with Trump's findings about the downsides of having general and unlimited access to phones in an emergency. In response, their system allows for teachers and other responsible parties to control access to the phones without making them entirely inaccessible.